National Building Museum Hosts Architecture & Design Film Festival in D.C.
WASHINGTON, D.C.—The National Building Museum will once again partner with the Architecture & Design Film Festival to produce the festival in Washington, D.C. (ADFF: D.C.), presented with the Revada Foundation. ADFF is the nation’s largest film festival devoted to the creative spirit that drives architecture and design. Over the course of four days, the festival will screen films that explore design and its connection to issues of social justice, diversity, technology, and equity, through the life and work of practitioners like Frank Gehry, Mies van der Rohe, Leslie Robertson, Renzo Piano, and Diébédo Francis Kéré. ADFF D.C. begins with an Opening Night celebration and D.C. premiere of Frank Gehry: Building Justice on the evening of Thursday, February 21, 2019. The festival runs through Sunday, February 24, 2019. The National Building Museum will be the venue for all films and hosts screenings in three separate theaters, including one in the Museum’s iconic Great Hall. New this year will be two festival lounges showing films from the 2018 AIA Film Challenge on a Sony short throw screen, as well as a Sony Home Theater, an intimate fourteen-seat venue that will showcase six different short films on the half hour throughout the festival. Frank Gehry: Building Justice follows architect Frank Gehry’s investigation into prison design in the United States. 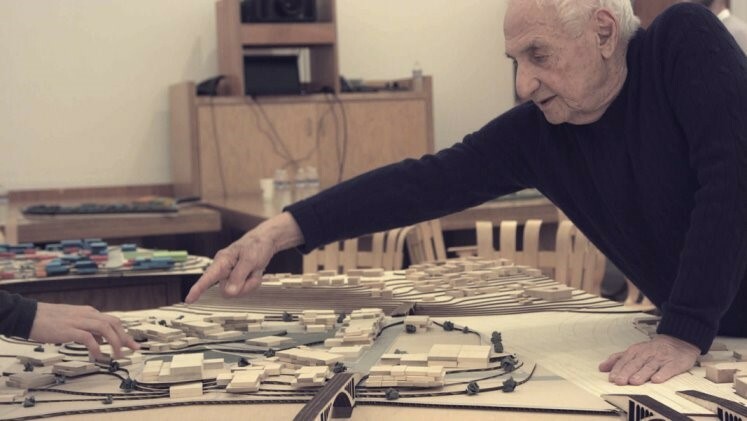 Gehry, at the invitation of George Soros and his Open Society Foundation, forms two “master studios” of the top architecture students in the country, from SCI-Arc in Los Angeles and the Yale School of Architecture. In collaboration with Susan Burton of the New Way of Life Reentry Project in Compton, California, Gehry and his students explore all aspects of prison design, witnessing how design flaws negatively affect those incarcerated. This is the story of Leslie Robertson, the lead structural engineer of the World Trade Center. Robertson oversaw the construction of the tallest building on the planet—and is haunted by its collapse and the events of September 11, 2001. Driven by Robertson’s pacifism and activism, as well as a powerful collaboration with engineer SawTeen See, LEANING OUT showcases the innovation of the Twin Towers and takes a deeper look into the buildings that symbolize so much. Celebrated Spanish director Carlos Saura captures the genius of one of the most famous Italian architects in the world: Renzo Piano, whose designs include the Center Pompidou in Paris, Francem the Auditorium Parco della Musica in Rome, Italy and The New York Times Building in New York City, New York. Saura follows Piano during the design of the Botín Center in Santander, Spain, examining his creative process. In a career spanning almost 70 years, the work of architect Balkrishna Doshi, who received the Pritzker Prize in 2018, has mirrored the evolution of contemporary Indian architecture. Doshi’s first job under the French architect Le Corbusier (who designed the Indian city Chandigarh) had a profound impact on him but he has often sought to interpret Corbusier’s modernism through local conditions of site, climate, and available technology. This short documentary portrait highlights Barbara Stauffacher Solomon, a groundbreaking designer who fused Swiss modernism with an iconic and bold California pop aesthetic to create the design phenomena known as Supergraphics. ADFF: D.C. is presented with the Revada Foundation of the Logan Family. With additional support from Pella Windows and Doors, Landscape Architecture Bureau, and Rockwell Group. Film stills and images from ADFF: D.C. 2018 available at go.nbm.org/ADFFDCpress.